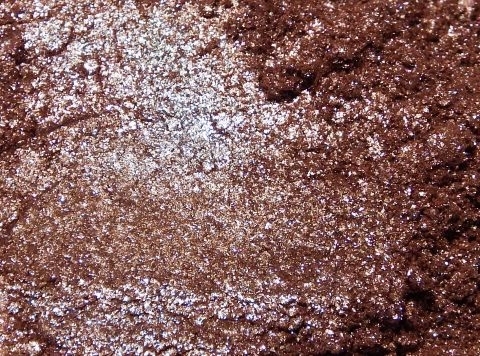 Shimmery bronze-copper base is topped with contrasting blue sparkle which turns pink. The base shade is warmer than it appears here. 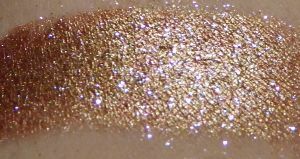 Swatch applied over regular primer to show it without enhancement, but you will want a sticky base to keep the sparkle in place. If using Pixie Epoxy, dilluting it with a drop of water before applying may work best. Note: As with all our Arcanes/Exquisites, you won't be able to see the color change as dramatically while wearing because your eyes are moving with the rest of your face of course. Initial color noted is from about an arm's length away, then as it appears closer to, or sharply angled toward, an indoor light source. Sunlight can wash out the colors and effect.